I knew from an early age that I was going to be alone. It was a weird, inexplicable feeling. When other girls played house and talked about boys, I read books. Don’t get me wrong. I’ve always been plenty boy crazy. I just have always craved solitude. It’s led to an odd life. Every few years, I find myself under the delusion that I’ve changed, that I can handle a real relationship as an adult now. I meet some boy and I give it my all until something changes — That something is usually me, the odd switch inside me that suddenly flips and turns me from every hipster male’s manic pixie dream girl into the damaged, distant heroine of an — yes, you guessed it — Okkervil River song. Okkervil River has always been there for me. The life of a Midwestern music industry multi-tasker has lead to me making a lot of moves and having few constants in my life but no matter where I was or who I was with, I was always only an iPod away from Will Sheff and his fellow Texans. Never was that statement more true than it was when I lived in Illinois. It was my first real attempt at living life as an adult. I had a cute little house from the fifties in rural Illinois and I’d met a boy. It was one of those situations that I described above. He was a young, tall, lean poet and I was a fresh-faced shop girl who worked at the local book store. I had the usual freak out that I always do — a sudden panic during which I realize I can’t do this, I can’t be normal. But for him, I fought it. And the next day, he broke up with me in an e-mail. I didn’t cry. I was more resigned than anything. It was just another strike against ever finding someone in my book. I was extraordinarily sad though and I called my best friend, Rachel. She came over right away. That moment was catharsis. There’s no other word for it. To the outside world, it might have looked like a couple of deranged teenagers shouting at one another in yoga clothes but inside that Ford, we were the girls Will Sheff sang about, “A Girl In Port” realized. Of course that endeared Okkervil River to us all the more. Rachel and I had a special bond that was built upon me doing what I do best: Introducing her to indie rock. We had little to nothing in common but when I burned her In The Aeroplane Over The Sea and Black Sheep Boy, an unlikely and lasting bond was formed. Since discovering the alt-country-folk-noir quintet, I’d wanted nothing more than a best friend who understood how great Okkervil River was. In Rachel, I found that. And on those back roads in Illinois, feeling the resolve of solitude once more, I felt fine. I knew it wasn’t a big deal. There’d be other boys I’d fall for and they’d break my heart even worse. I didn’t know that then, of course. I was young and innocent and I’d never even smoked a joint before. My naivety was so cute, you guys! But in my mind, I was a heart-hardened femme fetale, flicking the remnants of my cigarettes out my rolled-down windows as lightning bugs patterned the cornfields of the barren Illinois countryside. And Will Sheff was the gun slinging private eye who stole my heart. Or something. 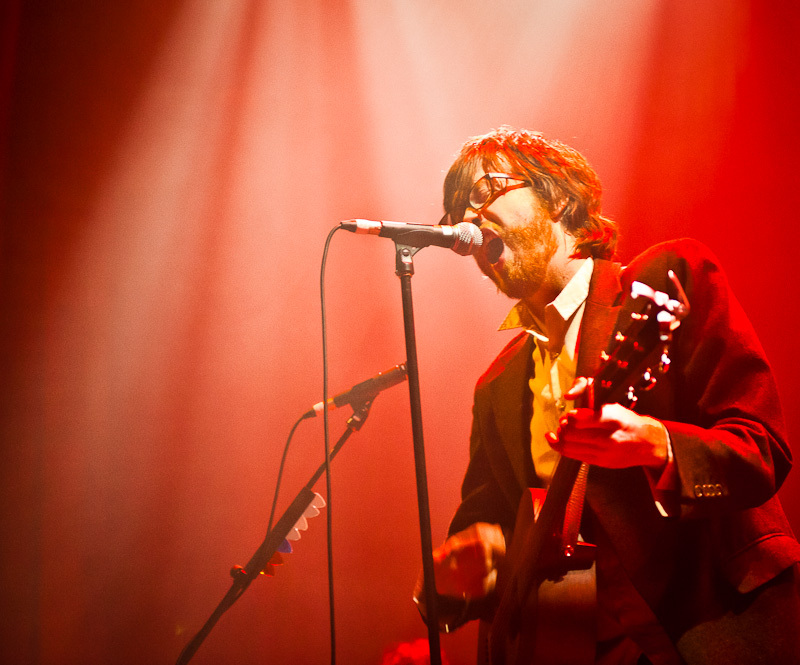 I have a lot of strange fantasies about Okkervil River. I’ve yet to meet anyone else who loves Okkervil River as much as I do. Rachel tells me that therein lies my problem with relationships: I’m just inherently incompatible with anyone who doesn’t think Black Sheep Boy is the best record, by far, of our generation. I swear, it really is and I will back that statement up with cold hard facts if I need to. The 2005 masterpiece is as accessible as it is artistic, brilliant as it is uncomfortable, beautiful as it is brutal. The album tears at your heart strings, from Sheff’s contemplative ballad of heartbreak, “A Stone,” to the one-two punch of album closers, “So Come Back, I Am Waiting” and “A Glow,” which cast Sheff as the villain of the record once more, the bloodthirsty monster that the titular black sheep boy has become. Never are the album’s best qualities on display better than they are in “For Real.” The song is a gentle but spooky lull until a jolt of guitars forty seconds in, accompanied by Sheff’s unhinged yelps about guns and blood and car crash carnage. It’s intense. And it tends to be the first song I play for people when introducing them to Okkervil River. And, with Rachel at least, it’s been a rousing success. As for my love life? Well, it hasn’t gotten any less abysmal, but I can roll with it. At least I’ve still got Okkervil River. Posted on November 21, 2011 at 8:00 am in Downloads, My Favorite Songs	| RSS feed You can skip to the end and leave a reply.